I’ve just played my annual personal “joke” on the Burpee Seed Company. 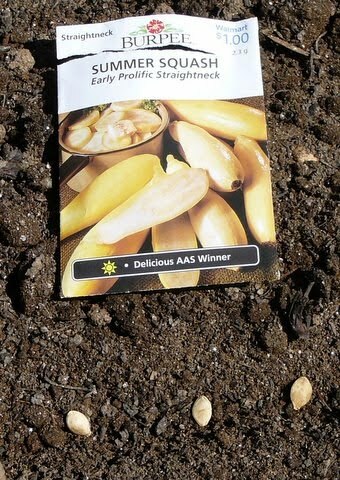 I’ve just planted the seeds of Burpee’s Early Prolific Straightneck squash, one of our favorites. The paradox is that the last week of June is not considered “early” on most gardening calendars. In fact, many gardeners will smile as they think of the leafy summer squash and pumpkin plants growing, even blooming, in their gardens, and Bob has just planted his squash seeds and won’t be picking his “early” squash until August. But I have reason for my apparent madness. By planting squash late I’ll avoid a problem I used to have every year—collapsed, dying squash plants, victims of the squash vine borer. By about July 1, most of the squash vine borer moths, which you might mistake for wasps, here in Central Maryland have laid their eggs at the base of susceptible plants, which include summer and winter squash and pumpkin. Since my squash will be poking through the soil about July 1, I hope to avoid the egg-laying females and then the larvae that kill squash plants by boring into the stems. Traunfeld said that late planting is not the only solution. Alternative remedies include wrapping stems with aluminum foil and using floating row covers early in the season before the squash flowers. He urges gardeners to check out the Home and Garden Information Center website’s Diagnostics page about the Squash Vine Borer, which includes key information plus photographs of a squash plant wilting after borer infestation, the adult moth, and a larva inside a squash stem. If you’ve had squash vine borer problems last year, chances are excellent that you’ll have them again this year. So plan ahead and plant another hill or two of squash this week or next. You too can outwit the squash vine borer. I have them in my pumpkin vine! I located and dispatched a few of the grubs this morning. I think I'll try a 2nd planting as you recommend.. but when should I expect to be picking pumpkins if I plant now? Pumpkins can be tricky because some varieties take a long time to mature. Best bet is to look on the packet and see how many days it will take. Will they have enough time to mature between the day you plant the seeds and the first frost date in your area? Generally the answer is Yes, but an early frost, well,…. I have picked green, late-planted pumpkins in November when frost threatened and had them turn orange in the house. It took a while, but they did not spoil in the meantime. I'm impressed, Hepatica. I've had no such luck. Perhaps I was growing a variety with especially thin skin, but they matured late, didn't cure in the garden, and turned to mush in our garage. You get two thumbs up. For me, two thumbs down. We planted our zucchini plants late and used row covers until last week. I am glad to know that helped prevent the vine borers. Thanks for the info.